You forgot to download Audio Merge Expert	. Click the link below to download it. Audio Merge Expert can perform two tasks: it can merge multiple audio files, just like its name points out, and it can convert audio files from one format to another. WAV, MP3, OGG, and WMA are supported for the conversion and also for the merging process. If you give Audio Merge Expert several MP3 files for example, it can merge them together into one larger WAV file . This application’s system requirements are very, very low. Even the recommended requirements are nothing for a modern PC: 1GHz processor or better, 512MB of RAM or more, at least 100MB of storage space, any Windows edition from Window XP onward. A very simple setup wizard will help you install Audio Merge Expert on a PC that meets these system requirements. The main panel on the interface lists all the files that you’ve loaded into the application. At the top there’s a toolbar with buttons to add files to the list, remove files from the list, open the Settings menu, initiate the conversion or merger process, and more. Down at the bottom there’s another toolbar that lets you select the output format, open the Settings Menu and initiate the conversion or merger process. Step 1 – load some audio files into the application by using the Add Files function. Step 2 – pick the output format: WAV, MP3, OGG, or WMA. Step 3 – initiate the conversion/merger process and wait for it to complete. Audio Merge Expert isn’t free and a prompt will show up every time you launch the application and remind you of this fact. Once your 10 executions limit is up, you’ll have to buy a license to keep using Audio Merge Expert, but I’ve noticed that uninstalling and reinstalling Audio Merge Expert resets this 10 executions limit. Audio Merge Expert works as advertised, allowing you to easily merge and/or convert audio files. The system requirements are very, very low; a simple setup wizard will guide you through the installation process. It will take but a moment to figure out in interface. 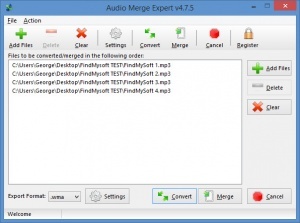 Using Audio Merge Expert to merge and/or convert audio files is a very simple 3-step process. WAV, MP3, OGG and WMA are supported. Trial limitations: 10 executions limit; nag screen. You can download Audio Merge Expert free here.